Developmental and intellectual disabilities (DD/ID) are a diverse group of chronic conditions that are due to mental and physical impairments. These conditions include Down and Fragile X Syndromes, Cerebral Palsy, autism, fetal alcohol spectrum disorders, pervasive developmental disorders and intellectual deficits. The legislature, DSHS, unions, providers, advocates and families have debated for decades the merits and challenges of quality of care, access to services and costs of delivery between the different models. The federal Centers for Medicare and Medicaid Services has threatened loss of federal Medicaid funding to portions of several RHCs, based on surveyed violations. DSHS and the legislature have asked the Ruckelshaus Center to provide process design and neutral facilitation to help parties reach consensus-based solutions around the mix of service venues, other potential uses of facilities and related policy recommendations to the legislature. For more information, contact Project Manager and Senior Facilitator Kevin Harris. The Center worked with Pacific Northwest University- Health Sciences to provide neutral facilitation services to a key set of healthcare providers, including hospitals and rural health centers in the Yakima Valley. Yakima has historically had a disproportionately high uninsured/Medicaid population- Medicaid transformation has swamped local healthcare provider’s ability to provide appropriate primary and specialty care services to their community. The Center facilitated a process to help executive and operational leadership collaborate to identify short-term interventions and longer-term strategic innovations that will help with emergency room diversion, physician and other practitioner recruiting, and other access to quality care improvements. The Ruckelshaus Center provided process design and facilitation services to the Snohomish County Health Leadership Coalition’s LiveHealthy2020 initiative. The Coalition is a convener of over 130 public, private and civic-based organizations, with the vision of improving the health and economic vitality of Snohomish County by improving nutrition, increasing physical activity, enhancing mental and emotional health, and fostering civic health & connectivity. 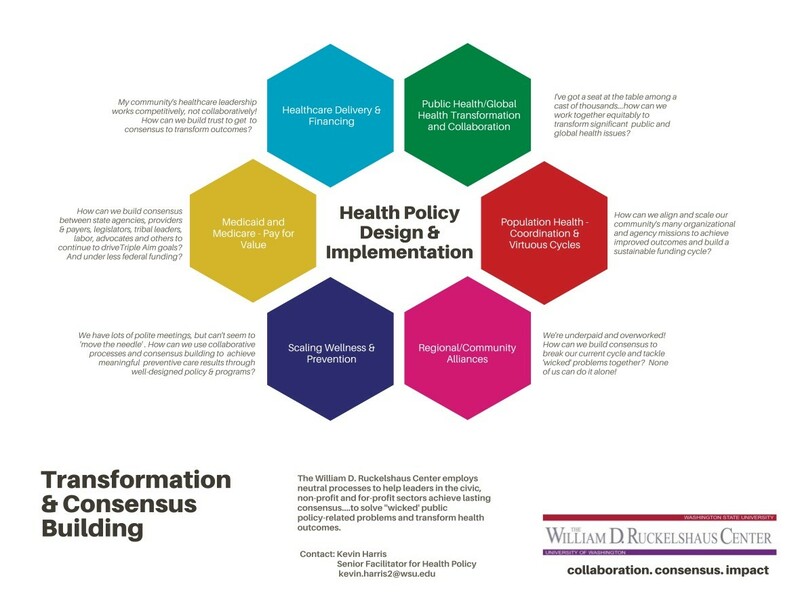 The Center helped the Coalition design and implement collaborative processes to help their diverse set of signatory organizations and others scale their ‘accelerator’ efforts to create larger impact around Snohomish County population health outcomes. In 2016, the Snohomish Health District asked the Center to assist in navigating a potential transformation of its governance and delivery of care. The Health District provides public health services to Snohomish County’s 755,000+ residents, from maternal and child health programs to safe drinking water. A 15-member Board of Health, including county and city elected officials, oversees policy and budget development. Supporting citizens of the fastest-growing county in Washington, the Health District has struggled with its role within statewide healthcare transformation, sustainable local and state funding, and board member turnover. The Center conducted a situation assessment — a series of interviews with a broad range of leaders and organizations throughout the community to discern issues, opportunities and dynamics among key parties, as well as prospects for collaborative dialogue, to identify and agree on long-term solutions. The District implemented many of the Center’s recommendations, to improve engagement and streamline the Board’s decision-making process. For more information, contact Project Managers Kevin Harris or Amanda Murphy. 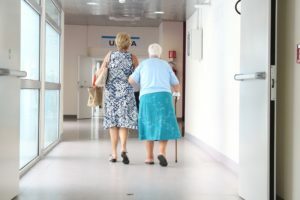 The Center partnered with the University of Washington’s Center for Health Innovation & Policy Science (UW CHIPS) on a project that examined eldercare workforce capacity in Washington state. In December 2012, the Center and UW HPC received a grant to begin the first phase of this project. 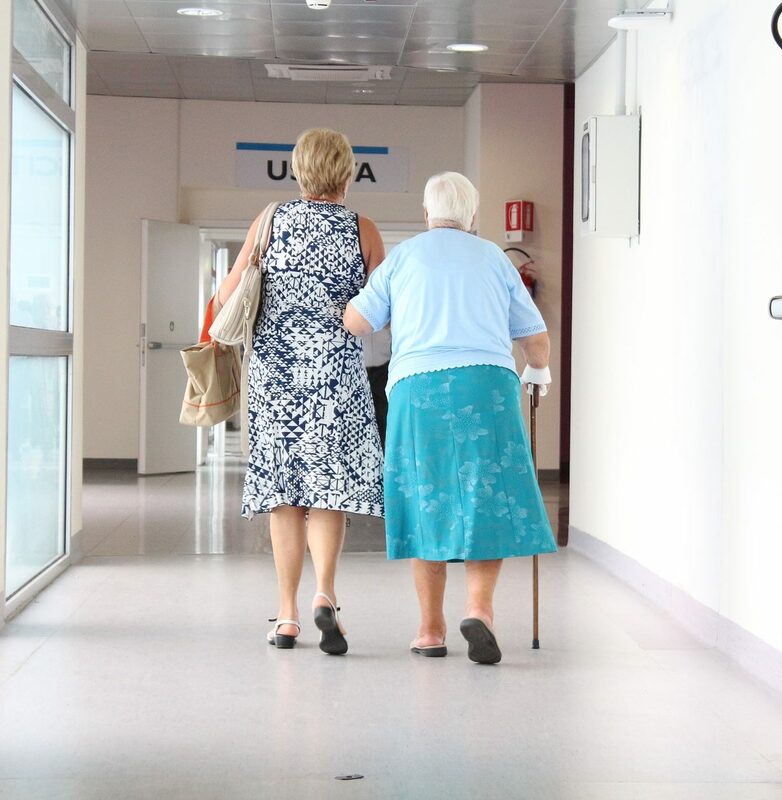 The Center also participated in a University Network for Collaborative Governance (UNCG) initiative to launch similar efforts in states across the country that will engage health care and workforce stakeholders in developing eldercare workforce strategies. The UNCG initiative will focus on: 1) Hosting a national colloquium on Eldercare Workforce Collaboration, resulting in a report to serve as the basis for a multi-state pilot; 2) A pilot to evaluate and report on results and lessons learned of the assessments; and 3) Convening assessments in several states through UNCG centers, including the Ruckelshaus Center. For more information, contact Senior Facilitator for Health Policy Kevin Harris. Between 2007 and 2012, the Center assisted in resolving long-standing disagreements concerning hospital staffing decisions. Concerns by the parties included the effects of nurse staffing levels in hospitals, patient safety, costs and working conditions for nurses. Numerous studies have been conducted for this national issue, yet no accepted resolution has been developed. In 2007, the Center held an initial forum between the Northwest Organization of Nurse Executives; SEIU Healthcare 1199NW, United Staff Nurses, UFCW 141, the Washington State Hospital Association, and the Washington State Nurses Association, in which they reached an agreement to work together. In 2008, these parties signed an agreement at a ceremony with Governor Gregoire to begin discussions facilitated by the Center. The goal of all parties in the discussion was to develop a model solution for this pressing problem in health policy. 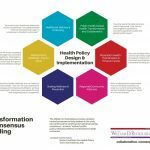 Are you wondering if your policy issue or project might benefit from the Ruckelshaus Center’s assessment- process design- neutral facilitation- consensus building expertise? Please check out this graphic (pdf) and contact Kevin Harris. Kevin Harris (pdf), Senior Facilitator – Health Policy, recently conducted a national webinar for the Association for Conflict Resolution entitled Collaborative Governance in Health: the Link Between Collaborative Process and Implementation. In case you missed it, watch here.